Tickets are still available for this popular outdoor wine tasting event featuring more than 100 wines, live music, and food from local restaurants. CORK - A Red River Revel Wine Event will return to downtown Shreveport on Saturday, Apr. 6. Regional wholesale wine distributors will pour more than 100 different wines during the event. The fourteenth annual CORK – A Red River Revel Wine Event, presented by Eldorado Resort Casino, will be held 2-5 p.m., Saturday, April 6 in downtown Shreveport’s Festival Plaza. Patrons attending Shreveport-Bossier’s premier wine tasting festival must be 21 years of age and ticket prices are $85 per person. A limited number of tickets remain available. Each patron will receive a CORK gift bag, a commemorative glass, and credentials necessary to enjoy a social afternoon of wine tasting. 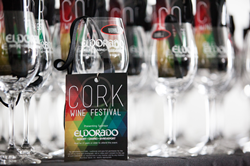 For complete festival details, or to purchase tickets, visit w ww.corkwinefestival.com. Regional wholesale distributors including Republic National Distributing Company, Southern Glazer’s Wine & Spirits, and Eagle Distributing will pour approximately 100 different wines, and several of the area’s finest eateries, including The Vintage, Tejas Kitchen Bar Patio, Superior’s Steakhouse, Fairfield Manor B&B, The Port Grill, and Silver Star Smokehouse will provide bite-size portions of their signature delicacies. Live music will be performed by Total Choice Jazz Band. The popular CORK raffle will feature prizes such as wine lots, tickets to CORK XV, hotel stays, dinners, and custom cookies. For the first time, CORK will have a silent auction where guests can bid on items including fine jewelry from Sid Potts and James Avery Artisan Jewelers, as well as a Traeger® Grill. All proceeds from CORK – A Red River Revel Wine Event will benefit the Red River Revel Arts Festival. Visit http://www.corkwinefestival.com or call 318-424-4000 for more information or to purchase tickets. For more information on planning a trip to Shreveport-Bossier, including information on hotels, attractions, restaurants and more, visit http://www.shreveport-bossier.org or call 1-800-551-8682.